The final stats don’t really tell the story, because the Bulldogs made them (and the score) respectable in the 4th quarter, when the game was over. The bottom line was The Citadel couldn’t get Furman’s offense off the field, especially in the second quarter (the Paladins had the ball for over 10 minutes in that frame alone). Bart Blanchard didn’t have a good day, the offensive line didn’t have a good day, three different running backs dropped passes…and yet the biggest problem (by far) was the defense’s inability to make a stop, any stop. Furman ran delayed handoffs and intermediate pass plays for good yardage all day long, the Bulldogs got no pressure on the QB…it was just ugly. — For the people behind me who kept yelling that Scott Flanagan was open on every play…no, no he wasn’t. I bet not every school has fans using binoculars like that. — I have finally come around to the idea that we have to do something about our cheerleaders. I was in favor of just ignoring the situation, but yesterday I watched a tubby little 10-year-old girl in the stands mock our cheerleaders for the better part of 10 minutes, without any provocation whatsoever. 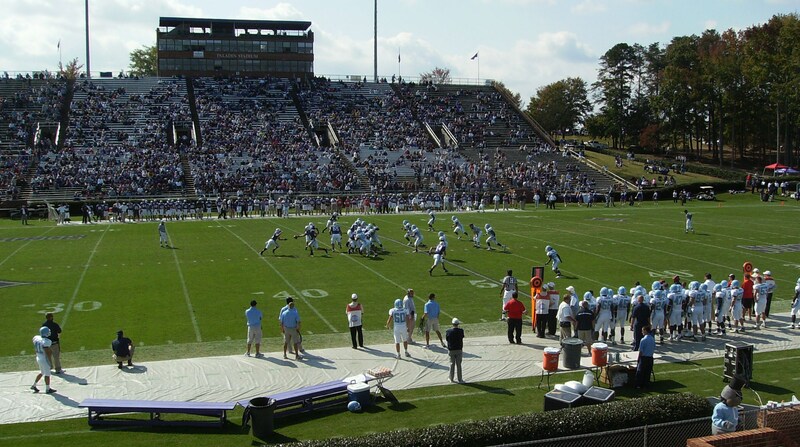 — Furman’s announced attendance of 9,644 apparently included at least 1,500 invisible fans. I think the folks at Furman have to be disappointed with the attendance, but I suspect it’s probably just a sign of the economic times. 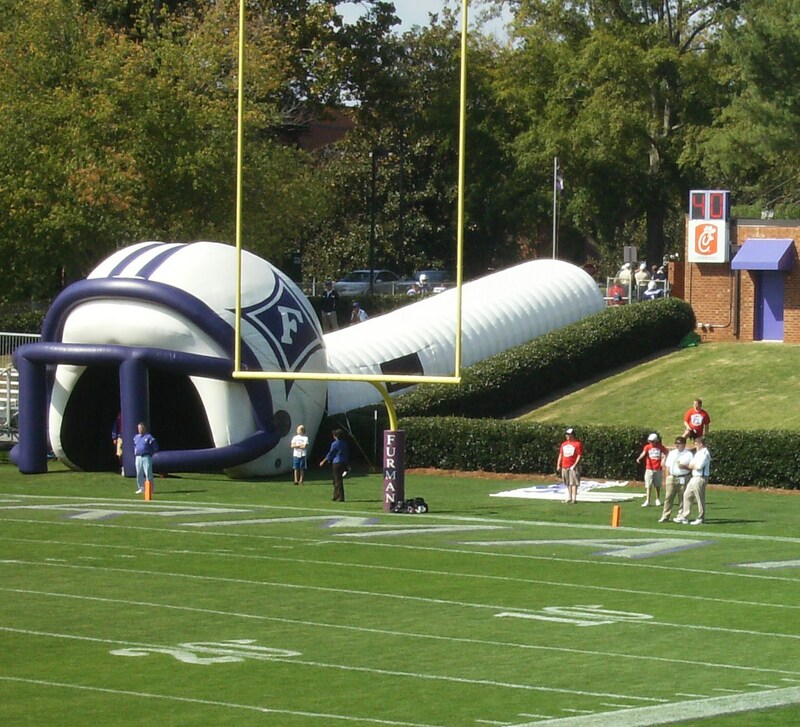 — Furman’s players run through one of those blow-up helmets (pictured below). I’ve always liked those. — The guy riding Furman’s horse took off his helmet/mask before the game started and rode around bareheaded the rest of the time. Why? It ruins the gimmick. He should wear the helmet the entire time he is in public view. Instead of a knight riding his trusty steed, we got to see a decidedly nondescript bald dude riding a horse.